Before there were iPods, iPhones, or even iPads, mp3 players were few and far between. Back then, the best way to listen to mp3s was on your computer. But what about when you wanted to take your tunes on the road? I needed a player that I could take to work and still have in the car, so I decided to find one of them new-fangled mp3 players. Hard drive based players cost an arm and leg back, then so when someone recommended an CD player that played mp3s, it seemed like a perfect match. 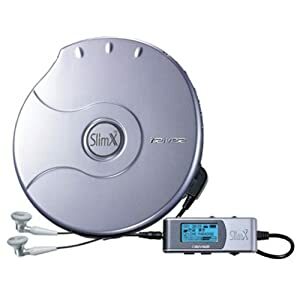 My first “mp3 player” was the iRiver SlimX mp3 CD player. It was slick, small, and played a whole lotta mp3s. (Keep in mind that no one was ripping mp3s any higher than 128kps, so it held quite a few songs- about 10 CDs worth). The iRiver SlimX was my go-to for about a year and half. But after a while I was tired of making new mp3 CD compilations everytime I got new music (not mention all the old CD compilations that were piling up…). I needed a solution that held all my music. Next was the Creative Nomad Jukebox. This had a whopping 6GB internal hard drive. I never fully filled it up. It was big – like a CD player-big. It has some syncing issues, but all in all, served its purpose. This one lasted about 2 years before abuse killed some buttons. Thankfully, I had a warranty and was able to trade up for a new model when it finally died. The Creative Nomad Jukebox Zen NX was the replacement and was a very nice and solid player. With 30GBs of space, it was like the infinite abyss for mp3s. It was very simply built. Just a monochromatic screen, a circuit board, and a laptop hard drive. So simple, in fact, that when I dropped it (it was out of warranty by then) I was able to drop in a replacement hard drive and voila! I was back in business. There was a very good community around the Creative players and it was really helpful in a pinch to search their forums for help. I think I gave that one to my mom… not sure if she still has it or not. The Nomad lasted a long while, and when the iPod came out and I wasn’t swayed. I still had a 30GB player, so why upgrade. The thing that finally convinced me to get one was its ability to play video… and 60GB hard drive… and a great sale price. So I took the plunge and got a 5th Generation 60GB iPod, and 5 years later, it’s still plugging along. I still see no need to upgrade to an iPod Touch, etc., as I still have loads of space. So, what’s next? Not sure. I don’t see any others out there that I’m interested in. If and when my current player dies, I’ll be forced to find a replacement, but til then, this one will be my carpool companion.